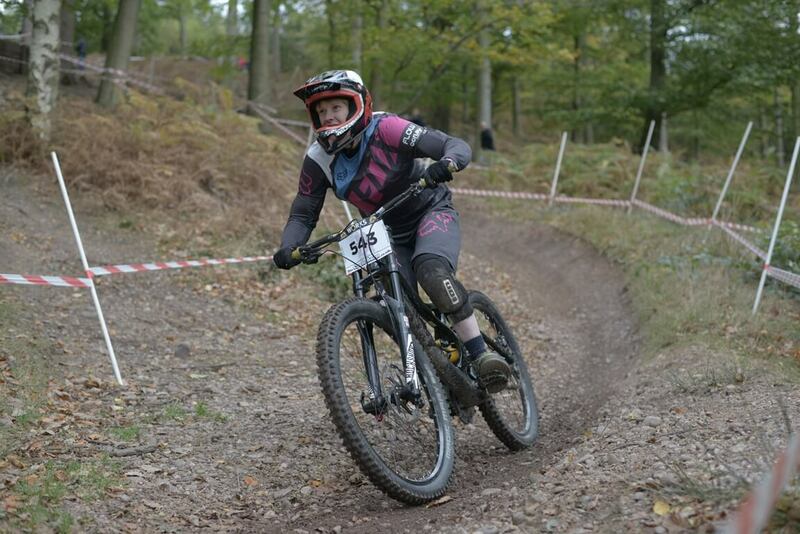 Racers Guild is a West Midlands based club with a focus on Downhill MTB who organise downhill races and events at Stile Cop, Cannock Chase. This was the fifth and final round of the series where Kate not only came 1st but also the overall series winner, here’s Kate’s race report. With a week to go until the final round of the Racers Guild Summer Series at Cannock Chase I headed up to Stile Cop to try and get myself over the two step downs at the bottom of the Black trail of which the race is to be held. The first step down is fairly sizeable and takes you down a nice long berm to the last step down which I would describe as more like a launch pad. I could visualise myself going over it but finding the nerve to let those brakes go was something else, you need to fully commit to reach that nice smooth landing zone. After a good half an hour of sitting frustrated and rolling up to the bottom step down I decided it’s now or never. Trembling holding tightly my bars I took a deep breath – you kind of know when you set off that you’re definitely hitting it with full commitment and this was the one! I can only imagine what face I was pulling as I threw myself off the bottom lip, I landed just shy of the down slope with a hard thud but I had survived !! Wahoooooo! I did a little dance and pushed back up for another go! The quicker I took the first step down with no brakes the better and smoother the landing of the final drop. There will always be a ‘B option’ in these races which is great, this leaves the race open to anyone who would like to have a go or if you’re like me it, will push you to ride features you thought were out of your reach. The Racers Guild Series attracts anyone from newbies right through to the seasoned pro, it’s very friendly and a heap of fun is to be had, so I couldn’t wait for race day to arrive. As the weekend approached so did angry storm Brian and inevitably the news on race day from British Cycling that the last two step downs would be closed for the race. I was starting to wonder where I might land after takeoff myself with the strong winds- and it certainly didn’t lower the mood around Cop for most riders as we lined up waiting to start practice runs. The Black trail certainly keeps you on your toes. Starting with a jump into a tight right berm and down two small rock drops you’re then presented with a small but tricky rock feature into a tight chicane. I watched many riders try and figure out how to actually ride these rocks with speed and still make the bend after – I’ve now seen the best way but it’s definitely something I need to work on! The track then carries on through the tree’s over another rock feature of which I had two pinch flats on so decided to jump and pray I didn’t catch a rock on my way down. There’s then another rock drop into twisting turns before you’re out in the open and into a larger and very loose chicane that would then set you up for the two step downs. Going round these step downs was quite sketchy at speed but you needed to try and keep as much speed as possible for the small uphill sprint to the finish line. With 4 chilly girls lining up to race it was nice to see a new face in the mix. The nerves were setting in so I was eager to get started- with all the tight turns on this track I was aiming to keep my flow and avoid charging in only to be grabbing at my brakes and leaving myself at a standstill. I set off down the track over the jump and into the first tight berm – all was going well until I hit the first rock garden loosing my footing, eeekkkk I couldn’t seem to find a moment to adjust my foot straight so the middle section felt quite messy, hitting the last drop with your foot turned out like a duck isn’t the most comforting feeling! I came out into the open and round the loose sketchy chicane now with my foot straight on the pedal I could concentrate on getting round the drops and onto the final sprint home. As I got down into the bike to ride the long berm towards the second drop I was greeted with shouts from family and race day buddies – a certain Adam Coxon was squealing so loud I don’t know how he has a voice left this week! Haha! As I came over the finish line I still felt my run went well even if it was a little messy at times and I was sitting in a close second place. My second run I decided to just go for it and pedal where I could and as much as I could, I know I can take the corners faster than I had in the first run and I’m sat here thinking I still know I can take them faster than both my race runs. Racing, as I’ve said before makes me tense up on the bike which isn’t great, especially on a tight track such as the Black trail. It can be pretty frustrating and almost makes you feel awkward on the bike, I’m sure this happens to plenty of us racers! I set off well and managed the first rock garden with no hiccups this time, getting straight on the pedals my run was feeling good. I jumped the second rock garden and set myself up nicely for the rock drop only to feel my left knee pad sliding down my leg! Oh bother! That’s never happened before ! I still went for it and thought I would deal with any crash consequences later ! Coming out into the open I trusted my tyres and kept the pressure on that outside foot to keep as much speed as possible, railing the long berm with my super white knee exposed I made it home with no scrapes. For anyone that knows me I’m pretty good at crashing, I even wiped Anita out as I went down in a dual slalom recently! Seriously only I could manage that! Doh! I was pleased to see I’d bettered my time by two seconds to take a very close lead and I’d also managed to bag the series win with four wins over the summer. I’ve had a great first season with some highs and lows, I’ve started to ride features I would shy away from and even ride features I’d never dreamt of. I owe a lot of this to Flow and my Flow team mates for their support and all the great people I have met along the way, also growing a pair when in need haha! You make a lot of friends taking part in racing for all different reasons. Thank you for a fab summer series Harry, Mick and the team. I’m looking forward to January when the winter season starts – If you’re thinking of having a go at racing just book on and do it! Photos: Prospect Visuals, Dave Price Photography.